CORDOBA, Argentina, July18.– At sunset on Tuesday July 17, General Paz Avenue in this central Argentine city was blocked between Santa Rosa and Colon streets. 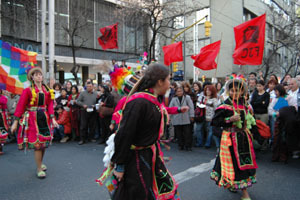 The indigenous peoples of San Luis de Potosi were performing a pre-Columbian dance to Pachamama (Mother Earth), exhibiting all the rituals to invoke a good harvest. Imbued in that same spirit, social and labor movements' from all over the continent have converged on Cordoba to show their support and commitment to the cause of regional integration. The gathering takes place as the 30th Southern Common Market (Mercosur) Summit is about to begin. They came with the conviction that efforts underway in this direction must be undertaken on the basis of sovereignty, social justice and the inclusion of all, as a prerequisite to untie the Gordian knot of oppression and marginalization that have affected their peoples for centuries. It was at the National Radio Auditorium that "The People's Summit to Articulate Alternatives in Latin America in Defense of Water, Land and the Environment" opened on Tuesday. Unlike its predecessor in Mar del Plata --in opposition to the US Free Trade Area of the Americas project and coinciding with the Summit of the Americas--, the current event is seen as an accompaniment to the visiting heads of states at the Mercosur Summit on July 20-21. Juan Gonzalez, Secretary of Regional Integration of the Argentine Workers Federation (CTA), told Cuban journalists that at the current juncture, it is indispensable to consolidate the integration process. However, he noted that it is not exempt from internal conflicts, like the one between Argentina and Uruguay over the construction of paper mills in the latter in detriment of the environment, and because ultimately, the subject is associated with a model of forest exploitation that favors transnationals. Gonzalez also pointed to the presence of US troops on Paraguayan soil, specifically in the triple border region which points to Washington's strategic control of the Guaran� Aquifer, the largest single body of ground water in the world. And finally, to cite another conflict within Mercosur, he mentioned the reaction of Brazilian and Chilean interests in response to Bolivia's just nationalization of its hydrocarbons. 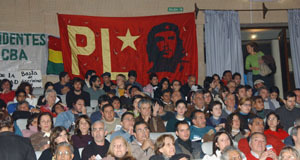 The People's Summit, which winds up Wednesday at the University of Cordoba, is holding workshops, lectures and conferences related to the defense of water, land and the environment; problems of external debt, militarization, the free trade agreements as obstacles to integration, distribution of wealth and the control of natural resources, among other issues. The conclusions of the event will be handed out to the leaders attending the Mercosur summit as a contribution to Latin American integration. Luis Bazan, of the Peoples Commission for Water Recovery, warned at the National Radio Auditorium, said that "fragmentation, sectarianism and division have only served the common enemies of our peoples. To repeat those mistakes would be unpardonable." Only unity will make possible the defeat of those who up to now have seemed unbeatable, he added. Media outlets are reflecting the massive presence on Cordoba's streets and avenues of participants in the Peoples Summit. They are waging an uphill battle that for the first time gives its support to the political will of several leaders, who even though each one shows his particular tempo when fulfilling common political tasks, they make up the cutting edge of a process that is long overdue in Latin America.